Dubsado CRM replaces the need to use up to a dozen different software to manage clients. That's one of the many reasons it's the top choice CRM for creative business owners. One of Dubsado's hallmark features is contract creation with e-signing. However, one of the most common oversights I see in Dubsado is making sure BOTH parties have signed an agreement. Yes, all too often Dubsado users forget to sign the contracts they send their clients. A client signs the contract and the business owner starts a project without countersigning. It's a simple mistake that leaves a lot at stake. While it won't be problematic most of the time, if it ever does become an issue, it'll likely to be from a less-than-ideal client. Why? Because if you think about it, your good clients won't push the boundaries of your agreement. At least one of those things is likely to happen in your business at some point. You don't want to find out you forgot to countersign your contract when it's too late. Don't be that person. Make sure you countersign your contracts. They are in the United States and most countries around the world. 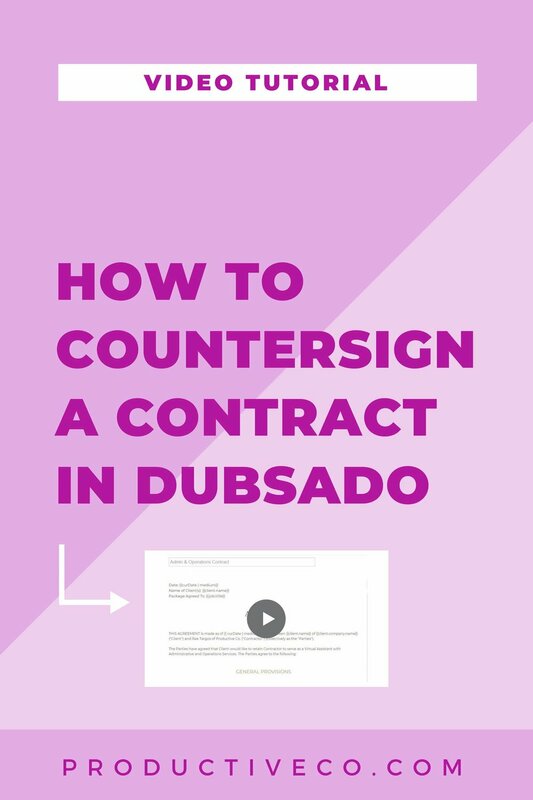 Don't know how to countersign a contract in Dubsado? It's very simple to do and you can do it in 15 seconds or less! That's all it takes to seal the deal with your client-service provider relationship! Ready to give Dubsado a try? Organize your Dubsado setup with a free blueprint to use as your guide.